For over two millennia, the Cyropaedia, an imaginative biography of the Persian king Cyrus the Great, was Xenophon's most popular work and considered his masterpiece. This study contributes to the recent rediscovery of the Cyropaedia and Xenophon, making intelligible the high esteem in which writers of the stature of Machiavelli held Xenophon's works and the importance of his place among classical authors. The ending of the Cyropaedia has presented a notoriously difficult puzzle for scholars. 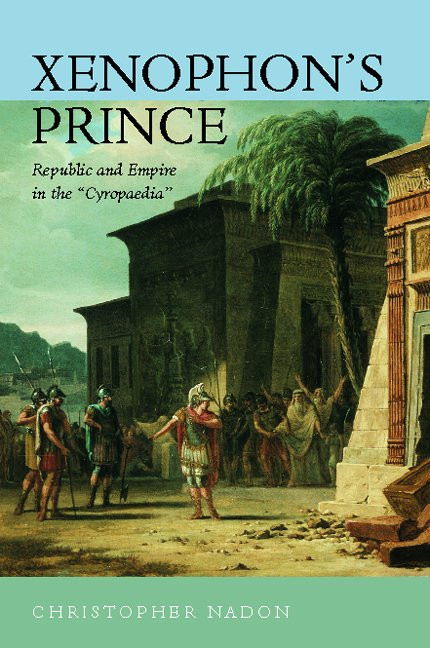 The bulk of the work seems to idealize the career of Cyrus, but the final chapter documents the swift and disastrous degeneration of the empire he founded. This conclusion seems to call his achievements into question. Nadon resolves this long-standing interpretive difficulty and demonstrates for the first time the overall coherence and unity of the Cyropaedia. He elucidates the Xenophontic critique of Cyrus contained within the whole of the work and unearths its analysis of the limitations of both republican and imperial politics. This provocative and original treatment of the Cyropaedia will be a definitive step in restoring the status of this important work. Nadon's lively, insightful study draws upon his deep knowledge and understanding of classical political theory and reveals in the Cyropaedia a subtlety and sophistication overlooked until now. Christopher Nadon is Assistant Professor of Political Science at Trinity College in Hartford.